We hear a lot about work/life balance and the challenges of achieving it. And when you work from home, finding this balance seems nearly impossible. Unless you live alone, you probably experience many interruptions during your work time. Or perhaps you find yourself multi-tasking - juggling work tasks, household tasks, and responding to the questions, requests, and conversations of the people you live with. Finding any semblance of balance in a work-at-home environment requires courtesy, respect for space and priorities, and a willingness to compromise when needed. As more and more people telecommute or do freelance work from home, the biggest concern is interruption. My husband recently shared with me that when he works from home, he feels a need to advocate for quiet work time. Apparently, not being accustomed to having him home during the day, I unknowingly interrupt him with my cheerful chattiness. This is common when family members or roommates keep different schedules. The person not working at the moment may disrupt the work of the other by playing music or the television loudly, blurting out a question, or entertaining visitors. Interruptions are bound to happen, but the only way to keep them at a minimum is to establish boundaries and ask that they be respected. One or more household members working from home means that courtesy and compromise must be employed there. 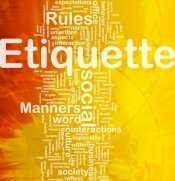 The bottom line is: good etiquette will go a long way! What spaces are shared? Does a schedule need to be worked out? What’s not shared? Do you each have separate office spaces? When is it okay to interrupt the other person? When is it okay to walk into the other’s office unannounced? Is there an understanding of how household responsibilities are shared during working hours? When one of you is “off duty” work-wise, is there agreement on when “home time” is? Do you have a user-friendly way of sharing schedule information, one that minimizes the need for "I'm working" reminders? Could you build time in your schedule to check up on how things are going for the other person? A common "lunch hour"? If annoyance arises, do you have an agreement to avoid negative or interruptive language? Using the magic words of “Please,” “Thank you,” “Good luck” “Thumbs up!” “You’re welcome, anytime!” are the validating and encouraging words we sometimes need to hear the most. While these words are always etiquette-ful, they can be even more meaningful when you are at home, yet can't be present with others who are also there. "Work from Home" Still Means "Work"
When you're at home, the doorbell rings, the dog needs to be walked, children need to be fed, the sink is leaking, the volume of the television is quite loud, and yet you are supposed to be working - and productive. Each of these distraction factors drive home the need for household courtesy. Agreements must be made and understood among everyone who lives in your home - even the dog. Communicating your needs and offering compromises are the best ways to maintain peace in your combined work-home lifestyle. Frustrations are bound to occur. Understanding priorities and the importance that each person places on the workloads at hand is vital for minimizing tensions. It is possible to be productive in your work, while sharing your home with others. Asking for respect for your job and the time you give to it, while showing respect for those with whom you live, will bring value to your shared worlds of life and work.